I got this idea from Martha Stewart and it has become one of my favorite things to make with ground beef from our CSA. It’s quick, it’s easy, and it’s delicious. On the table in less than 20 minutes too. Now that’s what I call good fast food! 2. You can easily make your own pizza dough, but I rarely ever do it anymore since I can buy reasonably good, organic frozen dough at the market. In a hurry, I have also been known to run down to the nearest slice joint and buy their dough. Most pizzerias will sell it to you, you just have to ask. I know. Gasp! I don’t make it from scratch? No. On special occasions, maybe. But if I’m tired and hungry, no. And that’s okay! Once your dough ball is made, defrosted, or acquired, you need to stretch it out. Start by flattening your dough ball into a disk. By flouring both sides, you avoid having to flour your countertop. Any hard surface will do to stretch out the dough as long as it is flat, clean, and dry. Using your fingertips, start pushing down on the dough, roughly making the border that will become your crust. Now begin using the palm of your hand to pull the dough away from you and away from its center while turning it. At this point, you can try tossing it up in the air. But every time I try doing that, I end up looking like a fool with dough on the floor. Instead, you can position your knuckles under the dough and start stretching it out off of your flat surface. This super helpful video will give you a better idea what to do (contrary to the video, you don’t actually need a marble or stainless steel surface. And just flour is okay if you have no semolina lying around). 2. Now that your dough is nice and stretched out, position it on your parchment paper- lined baking sheet. Egads! No pizza stone? No tiles or bricks wrapped in aluminum foil lining your oven to achieve optimal heat? No. When I can afford a real, wood-burning Neapolitan oven outside my villa then I will do things like they do in the old country. 3. Spread your marinara sauce around your stretched out dough. I buy this too. I really like the sauces from Sauces n’ Love. They’re wonderful. The pizza sauce is good. Very good. 4. Top the pizza with either the mozzarella or the provolone. I like the flavor of the provolone better with the ground beef, but I love the melty creaminess of mozzarella. Try one, or the other, or both. Maybe at the same time. 5. 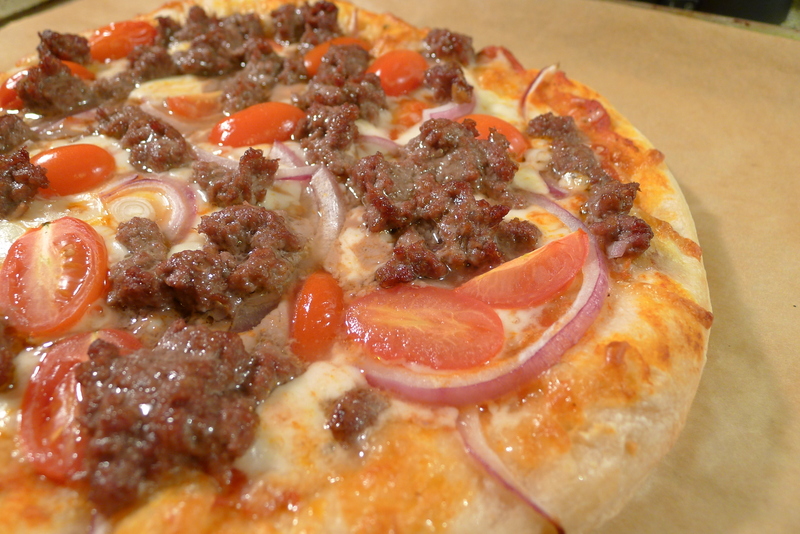 Scatter the onion rings, halved tomatoes, and RAW ground beef over the pizza. 6. Bake in the oven for 15 minutes, longer if you want a more browned crust. I kind of prioritize though: absent the hardware and capability to get a really excellent crust, I aim for just really excellently cooked beef. Shower your finished pie with Maldon salt, slice, and serve.